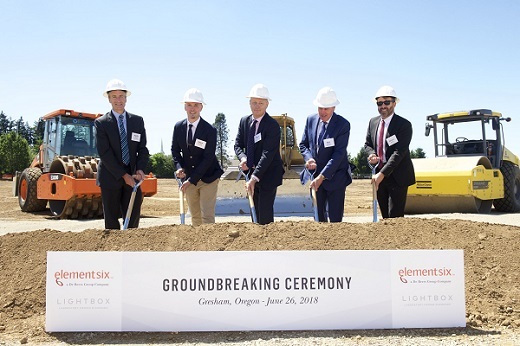 RAPAPORT... De Beers subsidiary Element Six has started work on its new $94 million lab-grown-diamond facility just outside Portland, Oregon. The factory will manufacture synthetic diamonds exclusively for De Beers’ new fashion-jewelry brand, Lightbox Jewelry. The groundbreaking ceremony took place Wednesday, Lightbox said. De Beers expects to complete the 60,000-square-foot facility by August 2019, with production beginning in 2020. The facility will have the capacity to produce more than 500,000 carats of rough lab-grown diamonds per year. It will complement Element Six’s existing manufacturing center in Ascot, UK.